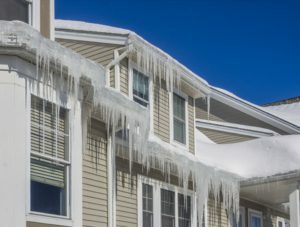 Now that we have had some snow accumulation and thawing, many homeowners begin to see the damage winter can cause and the need for roof repair. Typically, you will never be prepared or ready for when your roof begins to leak. Whether it comes as a small surprise or a big surprise, it is important to repair winter damage to your roof immediately to prevent damage to your home’s structure and integrity. Properly clear snow and ice from gutters, as well as brushing off accumulated snow from on top your roof. Replace cracked or falling shingles during dry seasons to reduce the risk of leaking in winter or spring. Repair or replace falling gutters to ensure proper drainage from your roof. The longer you wait to repair damages to your home’s roof, the more costly it will be in the future. Affordable roof repair is available. Our professional roofers in Michigan can warn you of potential damages that may be arising. See or suspect roof damage? Then schedule a free roof inspection today to ensure you don’t spend unnecessary money in the future. Are you in need of roof repair? Professional roofing experts are standing by to discuss your roofing needs. Whether you are looking to replace your entire roof, or need winter damage repair, contact us today. We serve primarily; Western Wayne, Oakland, Livingston and Washtenaw counties as part of the Metro Detroit area. This entry was posted in Roof installation, Roof repair, Roofing Company, Roofing Contractor and tagged damaged roof repair, ice and snow roof damage, professional roof repair, roof repair inspection, Roof repair Metro Detroit. Bookmark the permalink.